In cold operating environments such as ski resorts, material ropeways and guide pulley systems rely on precision bearings to ensure that maintenance, servicing and breakdown costs are kept to a minimum. In cold temperature environments such as ski resorts, strong winds, snow and condensation are a constant challenge for machine operators. Rolling bearings and plain bearings both play important roles in ensuring that material ropeways, guide pulleys, cable cars, ski lifts, mountain railways and other critical transportation systems remain in operation at all times and require little or no maintenance. The Schaeffler Group is working with a number of manufacturers whose equipment is required to operate in temperatures as low as -30 deg C and in high altitude locations where snow and high winds are a constant threat. These manufacturers produce ski lifts, inclined elevators, detachable and fixed chairlifts, gondola ropeways, aerial tramways and funiculars (cable trams or light railways). Most of these systems use pulley wheels, guide pulleys or rope pulleys. Each of these systems will normally require some sort of bearing arrangement to support the loads. In material ropeways, for example, design loads can be up to 40 tonnes. Line inclination is up to 45 degrees with spans of 1,500m over often-difficult terrain. Aerial tramways or cable cars are used to transport either heavy goods or passengers, some of these systems catering for up to 2,000 passengers per hour, depending on cabin size (from 6-200 passengers), travel speed (up to 12m/s) and system length. The guide pulley bearings must therefore be capable of withstanding the required loads, as well as the harsh environmental conditions, including freezing temperatures and snow, and the accumulation of condensate as the snow melts. The operator of the ski lift or tramway will want to minimise maintenance and servicing costs and will certainly not wish to replace bearings more then once during a skiing season. For ropeways, accelerators and guide pulleys, Schaeffler supplies manufacturers such as LEITNER and Doppelmayr with its single row deep groove ball bearings. These bearings are provided with lip seals on both sides that are made from nitrile butadiene rubber (NBR). The bearings are suitable for moderate speeds and axial loads, but are lubricated for life using a high quality grease. Schaeffler's single row deep groove ball bearings are capable of withstanding operating temperatures from -30 deg C up to 70 deg C. The bearings are designed to deal with the accumulation of condensate and offer longer operating life. 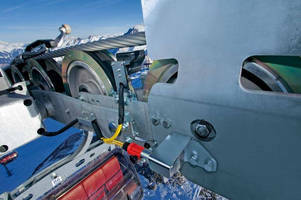 In similar applications, bearings in vertical mounting configurations are often required for ropeways and pulley wheels. For these types of applications, spherical roller bearings are the recommended choice. Schaeffler's standard spherical roller bearings with metal cages can also be used at temperatures down to -30 deg C.
Spherical roller bearings are double row, self-retaining units that comprise solid outer rings with a concave raceway, solid inner rings and barrel rollers with cages. The inner rings have cylindrical or tapered bores. The symmetrical barrel rollers position themselves freely on the concave outer ring raceway. As a result, shaft flexing and any misalignment of the bearing seats are compensated for. Spherical roller bearings can support axial forces in both directions as well as high radial loads. The bearings are designed for with the maximum possible number of large and extremely long barrel rollers, which means they support heavy loads. Due to the narrow osculation between the rollers and raceways, uniform stress distribution is achieved in the bearing. Schaeffler's spherical roller bearings are also available in premium quality standard. Branded X-life, this standard represents improvements in product design, product performance and service life that far exceed current standard values. As a result, under identical operating conditions, the basic dynamic load rating and basic rating life of these bearings are significantly improved. In certain applications, this means that a smaller bearing arrangement is possible. In applications such as funiculars or mountain/cable railways, liquid and solid contaminants can cause vertically mounted rolling bearings to fail prematurely. Schaeffler's GE..SW angular contact spherical plain bearings are therefore used as a plain bearing alternative to tapered roller bearings. GE..SW bearings are complete units comprising an inner ring with a convex outer slideway and an outer ring with a concave inner slideway that has a hard chromium ELGOGLIDE® low friction sliding contact surface. These bearings can support axial loads as well as radial loads and so are suitable for alternating dynamic loads. The bearings can also be used in pairs as preloaded units. Just as important, the bearings are maintenance-free throughout their operating life. In fact, the use of lubricant would lead to a considerable reduction in bearing life. These bearings are available for shafts from 25mm up to 200mm. Elgoglide® is a highly wear-resistant sliding layer made from PTFE fabric, which is embedded in synthetic resin and bonded to the outer or inner ring bore. This low friction, sliding material neither expands when exposed to humidity, nor heat-seals with metal. Elgoglide® is also resistant to most chemical agents and is ideal for use in rotary and linear motion applications. Spherical plain bearings with the Elgoglide® layer can be classed as maintenance-free because they replace the lubrication function. Relubrication of Elgoglide® bearings is therefore not required. In fact, relubrication of the bearings would destroy the carefully matched tribological system. Elgoglide® bearings offer a number of advantages for applications requiring high load carrying capacity and small swivel angles, such as long service life, small installation space and low friction. These maintenance-free bearings also minimise downtime and service costs, whilst eliminating the need and cost of lubricants.